Posted on Thu, Feb 2, 2012 : 5:06 p.m.
Ann Arbor Township-based transportation giant Con-Way Inc. reported today that its profit soared from $4 million in 2010 to $88.4 million in 2011. The full-year results, which included $16.6 million in one-time gains after a year with $28.1 million in one-time losses, included improved results for its core unit, Con-way Freight. 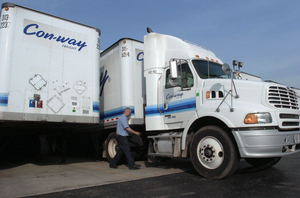 Con-way Freight's operating income rose from $1.8 million in the fourth quarter of 2010 to $19.6 million in the fourth quarter of 2011. For the full year, operating income rose from $28.9 million to $119.8 million. Con-way Inc., which moved its corporate headquarters from California to Ann Arbor Township in 2011, reported fourth-quarter profit of $23 million, up from $2.4 million in 2010. “The fourth quarter’s results capped a year of improvement driven by consistent operating discipline in all of Con-way’s core businesses,” Con-way Inc. CEO Douglas W. Stotlar said in a statement. With about 31,000 employees throughout the country, the less-than-truckload shipping company is the largest for-profit organization headquartered in Washtenaw County. The company's stock (NYSE:CNW) was generally flat after-hours trading to $32.97 at 5:04 p.m.
Con-way Inc. has about 31,000 employees. Fri, Feb 3, 2012 : 8:11 p.m. Numerous comments were removed because they were off-topic and commenting on this story has been closed. Fri, Feb 3, 2012 : 5:34 p.m.
Um, not to interrupt the mindless cheerleading, but they seriously missed their numbers and their stock is down 7% as a result. Fri, Feb 3, 2012 : 12:44 a.m.
Thu, Feb 2, 2012 : 10:44 p.m.